The Celestron Spotting Scope line includes everything from ED glass refractors, entry level refractors, and three Maksutov-Cassegrain spotting scopes that perform exceptionally for both terrestrial and astronomical observing for any outdoor activity. The Regal M2 spotting scope series is the next generation of Celestron's top-performing Regal F-ED spotting scopes. Lighter weight, the Regal M2 is optimized to provide Celestron's sharpest images available, using their proprietary XLT coatings. 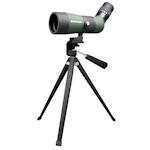 Celestron calls their Hummingbird Spotting Scopes the first "micro" ED spotters. Available in 7-22x50 and 9-27x56, they are small enough to fit in a pocket and easily affordable for this quality of glass. 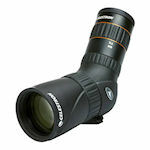 Celestron Landscout spotting scopes are a lightweight, compact and inexpensive. 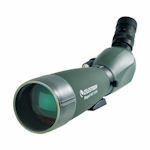 Landscout scopes come in 10-30x50 and 12-36x60 models, and feature multi-coated optics. 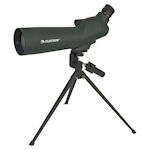 Landscout scopes are ideal for use at an indoor shooting range, or when you want a lighter scope on a long hike. This line features Maksutov-Cassegrain spotting scopes that perform exceptionally for both terrestrial and astronomical observing, and we redesigned and updated the existing Celestron spotting scope models. We now have a more complete line of spotting scopes than at any time in Celestron’s history. Celestron TrailSeeker Spotting Scopes are waterproof and nitrogen purged and feature rubber armoring, XLT multi-coating, and a dual focus knob for coarse or fine focus. They are available in angled and straight versions of 18-48x65, 20-60x80 and 22-67x100 configurations. 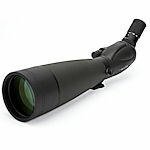 Celestron Ultima scopes are available in 65-, 80- and 100-mm objective lens sizes, each in angled or straight body types. All Ultima scopes are waterproof, and come with a zoom eyepiece as standard equipment. Ultima spotting scopes offer excellent optical quality at a reasonable price, and are backed by Celestron's No-Fault lifetime warranty. 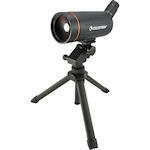 UpClose is Celestron's budget line of refractor spotting scopes. 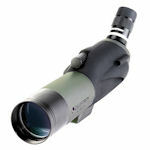 They are low cost, lightweight zoom spotting scopes in 15-45x50 and 20-60x60, angled or straight bodies. Fully coated optics. Waterproof/fogproof.